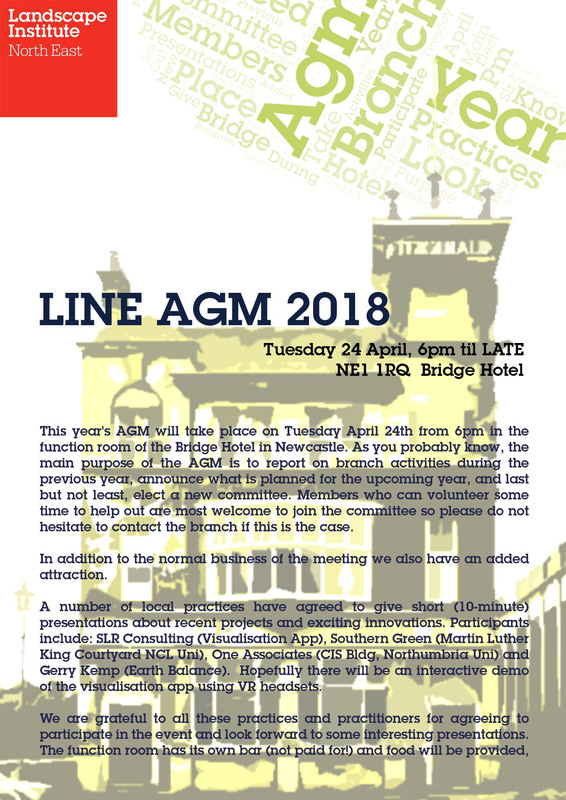 This year’s AGM will take place on Tuesday April 24th from 6pm in the function room of the Bridge Hotel in Newcastle, NE1 1RQ. As you probably know, the main purpose of the AGM is to report on branch activities during the previous year, announce what is planned for the upcoming year, and last but not least, elect a new committee. Members who can volunteer some time to help out are most welcome to join the committee so please do not hesitate to contact the branch if this is the case. In addition to the normal business of the meeting we also have an added attraction. A number of local practices have agreed to give short (10-minute) presentations about recent projects and exciting innovations. Participants include: SLR Consulting, GlenKemp, Southern Green, Wardell Armstrong and Gerry Kemp. We are grateful to all these practices and practitioners for agreeing to participate in the event and look forward to some interesting presentations. The function room has its own bar (not paid for!) and food will be provided, so we look forward to seeing as many members in attendance as possible.